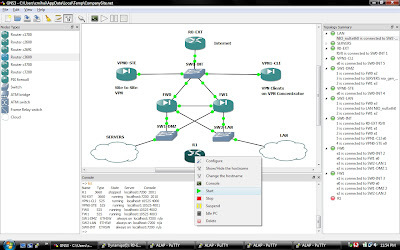 GNS3 - Graphical Network Simulator - is a Cisco router and firewall simulator based on ns 3 and Dynamips for Windows, Linux, UNIX and MacOS systems. It contains a complete Cisco lab solution, including Dynamips, Dynagen, Idle-PC, PixEMU and a graphical design tool. It can be used to design home labs and training for CCNA, CCNP, CCIP or CCIE certifications or testing configurations.